Dental implants are the preferred method for replacing missing teeth, whether you’re missing one tooth or many teeth. Our Board-Certified Prosthodontist and Implantologist, Dr. Thomas Maveli, can give you back a beautiful, fully functioning smile with the help of dental implants. Dr. Thomas Maveli obtained his Master of Science degree in prosthodontics and completed a dual-major Advanced Dental Education program in prostho- dontics and implant dentistry at Loma Linda University School of Dentistry in California. 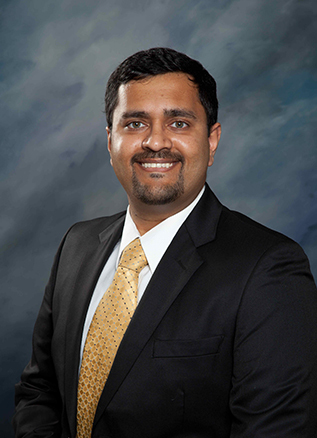 Dr. Maveli is board-certified as a Diplomate of the American Board of Prosthodontics, and is also a Fellow of the American College of Prosthodontists. Thanks to his specialized training, Dr. Maveli is an expert at presenting patients with options for preserving their teeth over the long-term with restorative dental treatments. He enjoys helping his patients get back a smile they love showing off. A dental implant is a small titanium post that is inserted into the jawbone in place of a missing tooth. After Dr. Maveli has placed the implant, it will begin to integrate with your jawbone, eventually creating a strong and solid anchor for a restoration to go on top. If Dr. Abraham or Dr. Maveli recommends a dental implant to restore your smile, they will go over the procedure in depth with you beforehand. Our practice offers immediate implant placement, as well as provisionalization (placement of a dental implant immediately following a tooth extraction). They look, feel, and function like your natural teeth. There are a number of options for dental implant restorations, and the one that is best for you depends on the number of missing teeth, as well as the recommendation of Dr. Maveli. If you’re missing a tooth and want to know if a dental implant is right for you, call Capstone Dentistry today!